I’ve grown up always knowing I was adopted. It was never news, I just always knew. And I was lucky enough to be in an extended family (both sides) that always knew and never saw it as an issue either. In fact, more often than not, it was something forgotten. It wasn’t secret, it wasn’t taboo, and we were just family. With my adoptive parents (I never call them that, for the record), my mom is Irish and my dad is German, but I’ve never known what I am. Several years ago, when access to adoption records was changed, I was able to request my information. From this, I learned that I am also Irish on my mom’s side and German on my dad’s. 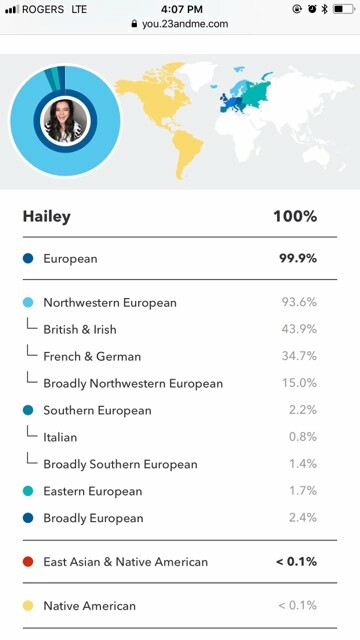 Haha But still, it didn’t give any specifics of what that actually means, so I was super excited to get my results back to see exactly what my Ancestry Composition is. 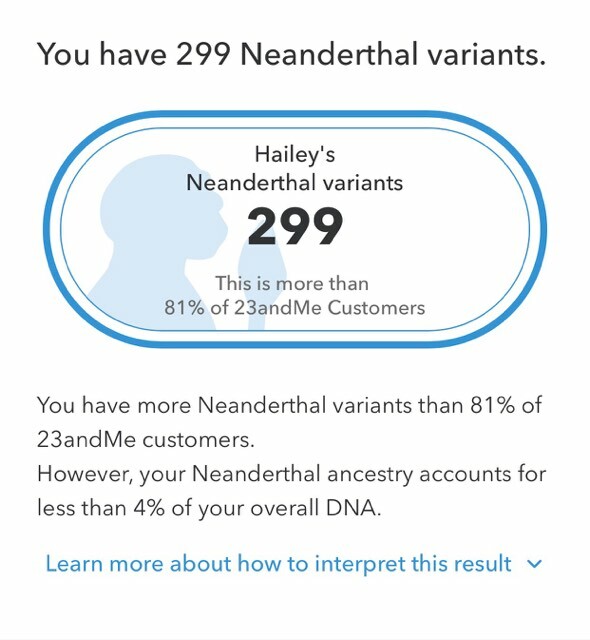 23andMe also captures Neanderthal Ancestry, which is both humorous and interesting, especially since I have more variants than 81% of 23andMe customers. 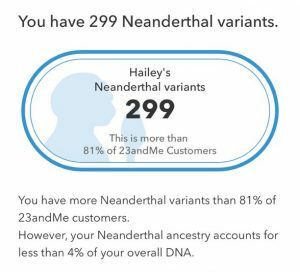 Even still, it’s less than 4% of my DNA. Overall, nothing shocking, though certainly fun to discover. However, there is a part that was quite unexpected and is actually information I received from my cousin, who I found through the DNA matches. 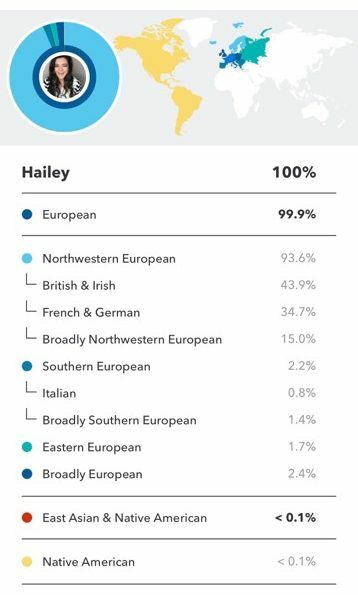 French and German accounts for 34.7% , and the German portion comes largely or exclusively from my Hutterite ancestors. My grandmother (who I’ve been told they called MeeMa, which I adore), was one of NINETEEN children and was raised on the colony, though she and a few siblings were the first to leave. 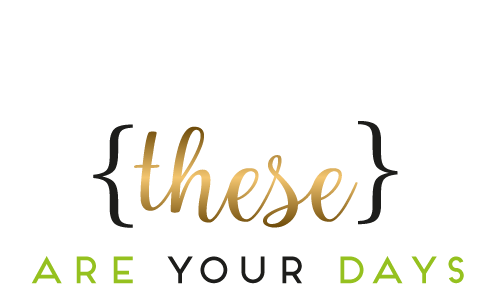 My DNA matches showed a few with well known Hutterite last names so I knew I had some connection but I had no idea where or how they fit into my Family Tree. It’s pretty amazing to piece these things together. Fun fact: Ever since I went on a fieldtrip to a colony as a kid, I’ve been impressed by their resourcefulness and even recently, after going to a local colony’s Christmas concert a couple of years in a row, have been dying to get myself into their kitchen to spend time learning all the food things. I’m telling you, I’ve never had cheese that tasted so good. You guys, it’s all so mindblowing. But even still, this is not all. There is still so much more – more I know already, and even more I haven’t even started to learn.